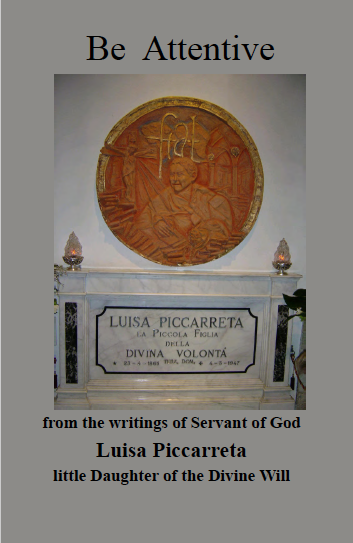 The following pages contain the translation from the original text in Italian of a Biography of Luisa Piccarreta written by Father Bernardino Giuseppe Bucci, in 1980. 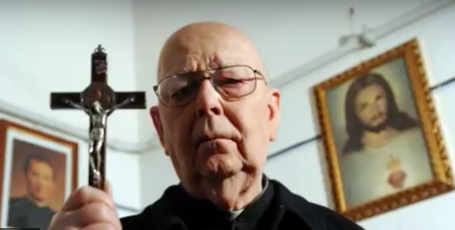 Father Bucci is one of the last living personal witnesses of Luisa. He is a Franciscan Priest, and lives currently in Trinitapoli (Foggia), not far from Corato. Father Bucci is the nephew of Rosaria Bucci, “Luisa’s faithful and silent confidant”, who lived with her and assisted her for forty years. 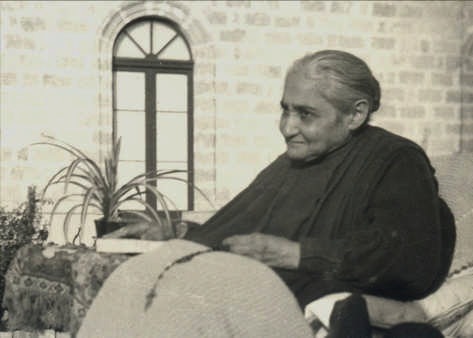 Father Bernardino Bucci visited the house of Luisa between 1942 and 1947 – the last five years of her life – when he was still a child. In the following pages, he presents highlights from the life of Luisa, and also unique anecdotes and circumstances from his personal and direct encounters with Her. To dearest aunt ROSARIA BUCCI humble and faithful confidant who, for forty years, lived in the shado of a creature so close to God whose Secrets and Spirituality she gathered. G.B. This is not a preface – nor does it intend to be so; it is only the expression of a feeling, as one might say, in the warmth of the moment, after reading the pages which follow, and which deeply touched (it is fair to say it now) the soul of one who, like me, had the privilege to be among the first, if not the first, to read them and meditate on them; to read the life of Luisa Piccarreta of Corato, “the Little Daughter of the Divine Will”. 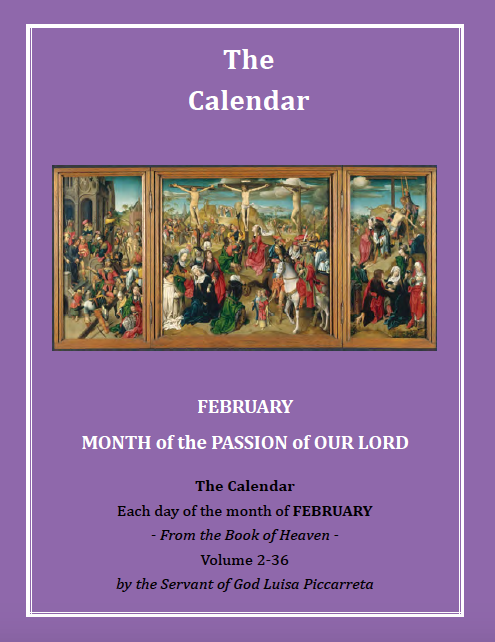 On the one hand, in this book one can find a woman – a life, which is certainly that of a saint; on the other, a priest who wrote of this creature with a simplicity which is all Franciscan, and with an ardent spirit of filial love. 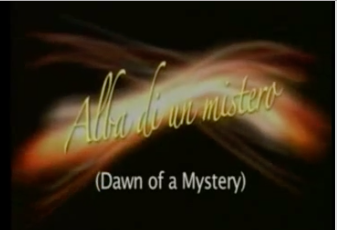 He has had the fortune to know Luisa – “the little Daughter of the Divine Will”- for many years, nailed to a bed, which would have been a bed of sorrow for anyone else, but which was for Her an anticipation of Heaven upon earth, in spite of the atrocious sufferings caused by the assaults of the evil spirit. But the “visits” of the Divine Lover, Christ, Who had wanted to make of Luisa the servant of the “Divine Will”, consoled Her, giving Her the ineffable certainty of Paradise – the smile of God. It is not easy to write about any human being, and especially about an exceptional person, like Luisa Piccarreta. Yet, the author of this biography, which I have the honor to present to the reader, fully succeeded in portraying her character; allowing the reader to penetrate, little by little, with no strain, into the intimate life of this sublime creature, who remained crucified in a bed for seventy years, managing to transform her room into an ardent cenacle of love for Christ; teaching through her own life – and this is the most beautiful “lesson” – to love that Jesus of Nazareth, Who calls whomever He wants, and nobody can resist His call. The author of this biography was also able to describe the environment, the places and the people, in an admirable way, as though expressing it in prayer, or as though listening to arcane melodies. 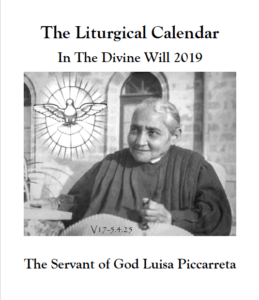 He evoked images and moments of his childhood, of his youth, and of his maturity as a man and priest, with extreme delicacy, remaining always in the shadow – or better, in the light – of Luisa Piccarreta. This excelling soul, who had attended school only up to the second elementary grade, wrote something like thirty-six volumes (in the form of a diary), charged with highest spirituality, extraordinary uniqueness, and finest theological intuition, which only a direct and continuous relationship with Christ could have inspired! With sober but incisive words, the author described the scenery in which this story of love and sacrifice takes place: the sunny and generous Puglia; a Puglia with its strong people, who can still speak of God with the vehemence of the prophets of the Old Testament. 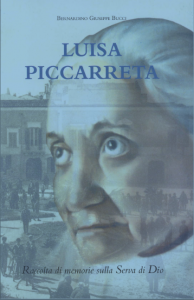 With prudence, but without reticence, the author described the incomprehensions and the bitternesses which were also present in the life of Luisa Piccarreta; and here his voice rises, clear and serene, though veiled with sadness. But soon the voice of the author revives again, and its tones becomes sonorous like bells on Easter Day, when he remembers the work of courageous priests who followed Luisa on her difficult but joyful journey. 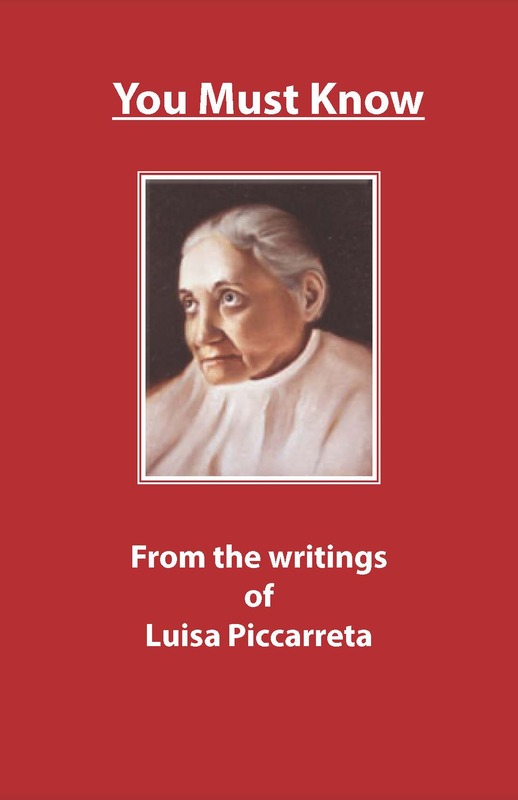 From the limpid and measured style of the author, the figure of Luisa Piccarreta arises more than ever, vivid and real, powerful and sculptural, though preserving her humility. When Luisa died, all the people crowded streets and balconies to see the transit of the “Little Daughter of the Divine Will”, accompanied by illustrious Prelates and by all the clergy. But Luisa Piccarreta is not dead: She continues to live in the memory of those who had the fortune to know Her and love Her. This biography delineates very effectively the outlines, which fade into the infinite heaven of the souls chosen by God. I was only a little child when, on the knees of my mother, I heard her speak for the first time of “Luisa, la Santa”. This was the first contact I had with Luisa, which aroused great curiosity in me, and a great desire to know her and speak to her. This was not difficult for me, because my aunt Rosaria Bucci had been living close to Luisa from her childhood. This first encounter with Luisa will remain in my life as a point of reference along the paths, not always flowery, of my youth and of my priesthood. Many other encounters followed this one, ever more familiar. In fact, when I grew enough to be able to go to school by myself, I used to go to the house of Luisa on various errands. I used to bring big fresh flowers that my father had just picked in the country. At other times, I used to go together with my sister Gemma, who, for a period of time, went to Luisa almost every day in order to learn the work of tombolo. Being in the room with the pious lady, our office was to pick up from the floor all the needles that had fallen while Rosaria and Luisa were working at the tombolo. A contest to pick up the needles arose between me and my sister, under the pleased and benevolent eyes of Luisa, who rewarded us every time by giving us little holy pictures. These have been the most characteristic encounters and the most beautiful memories of my childhood. While still a child, I kept hearing the name of a woman who had been bedridden for more than forty years. My mother was fond of her, and often spoke about her. 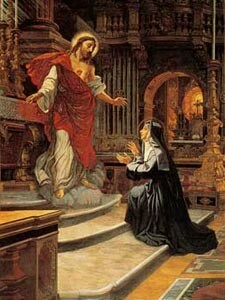 Especially in the moments of sorrow and oppression, she would run to her to implore her prayers. 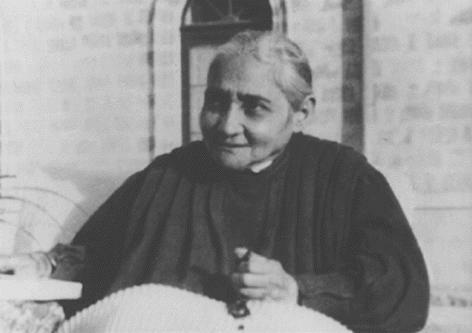 After twenty years, I went back to visit this soul again, and I found her always the same: placid and smiling, working with the fusetti of the tombolo in her hands, or with the rosary between her fingers, in attitude of prayer. For all those who saw her and visited her, she had always the sweet word of the Will of God on her lips, and was able to bring to everyone peace to their souls and consciences, and smiles to families. Upon entering her little room, turning the eyes to the right, the visitor found a bed surrounded by a curtain. On this bed a woman had been lying for about seventy years, always serene and fresh as a daisy. 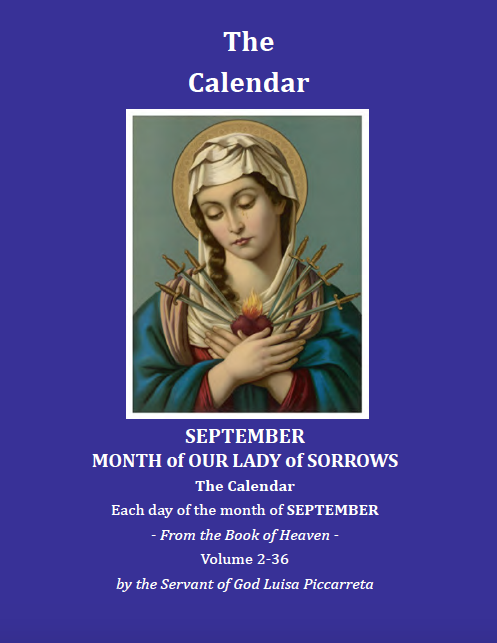 Small in stature, lively eyes, penetrating look, her head slightly leaning toward the right, this virgin lived alone with her sister – never a lament, never an act of anger. One could see her always sitting, leaning on three pillows, with a crucifix – on which she wanted to model her entire existence – in front of her, hanging from the bar of the curtain. Lifting the veil of the curtain, one could see an altar, upon which every morning a Priest celebrated the Sacrifice of the Mass. Near it, a closet in which the sacred vestments were kept. Nothing else, except for a balcony from which, every once in a while, she used to get some air and sun. Seventy years in bed! One entire long existence. 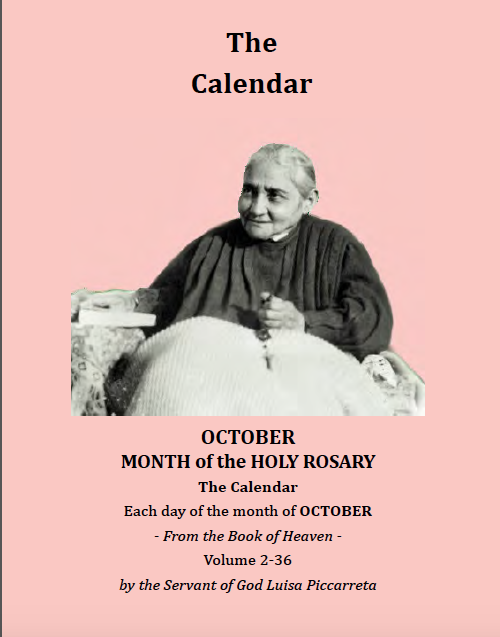 Well, from 1878 to 1947, this soul spent her life in solitude, in suffering, in silence, and in prayer. Luisa was a lively and a sturdy girl, like many other girls of those healthy and patriarchal families which still exist in our land, who love to live in the open countryside, among the fragrance of thyme, the bleating of the sheep and the harmony of the domestic animals which still populate our farmyards. Our Puglia, austere and rough, industrious and sober, reflected the nature of its inhabitants. A tenacious land, a land with a heart of stone, in which God wanted to fulfill His ancient promise: “…I will give you a new heart and a new mind. I will take away your stubborn heart of stone and give you an obedient heart. I will put my Spirit in you and will see to it that you follow my laws and keep all the commands I have given you” (Ez. 36, 26-27). Indeed the Lord blessed this land, giving numerous souls, who, in recent times, have drawn crowds of faithful to God. Everyone remembers Saint Padre Pio of Pietrelcina, who transformed the stone of Gargano into a beacon of light for both faithful and unbelievers. Luisa was born in Corato, province of Bari, on the morning of April 23, 1865. Her parents, Vito Nicola Piccarreta and Rosa Tarantino, had four daughters: Maria, Rachele, Luisa and Angela. 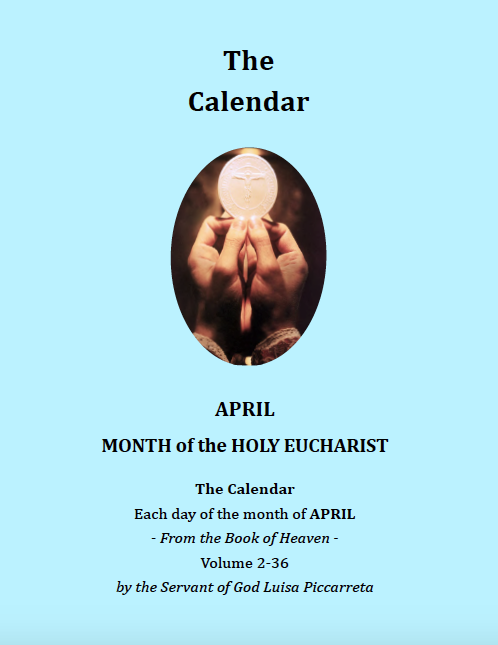 Luisa was born on Sunday morning “in Albis” (the first Sunday after Easter); for her family, this event was a happy premonition, and in this joy, on the same evening, her father took her to the Church where she received the Sacrament of Holy Baptism. 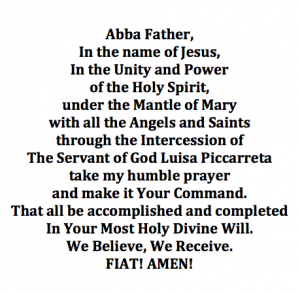 On the knees of her mother and of her dear father, Luisa learned the first elements of the faith. Her parents were for her the first witnesses of that faith, strong and clear, which forms the true richness of our families. During her tender years, Luisa was of rather fearful temperament; this was the consequence of some visions (Luisa calls them dreams) of the evil spirit, who terrorized her continuously, to the point of making her shiver, bathed in cold sweat. She tried to conquer this emotional state by hiding behind her bed, or in seeking refuge in the arms of her mother, in which she felt safe. These things happened to her especially when she went with her family to the farmhouse, called “Torre Disperata”, located in the territory of Murge, 27 Km (~ 17 miles) from Corato. Those who know these places can appreciate the solemnity of the silence which reigns there, and the hills, sunny, bare and stony. 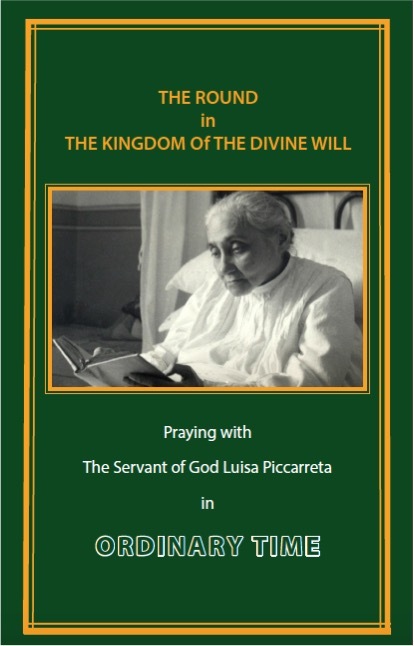 When she was assailed by the evil spirit, in that solitude, Luisa turned to prayer. She prayed incessantly to the Most Holy Virgin, asking with tears and filial trust to be freed from such anguish. Her tender years went on like this, embittered and unhappy, living always isolated, without ever taking part in the innocent games, typical of children. Divine Providence was leading this child along these mysterious paths, in such a way that Luisa knew no joy other than God and His Grace. In fact, one day the Lord would say to her: “Listen, I went around the earth, over and over again; I looked at all creatures, one by one, in order to find the littlest of all. And among them all I found you, the littlest of all. I liked your littleness, and I chose you. I entrusted you to my Angels to guard you, not to make you great, but to preserve your littleness. Now I want to begin the great work of the fulfillment of my Will. 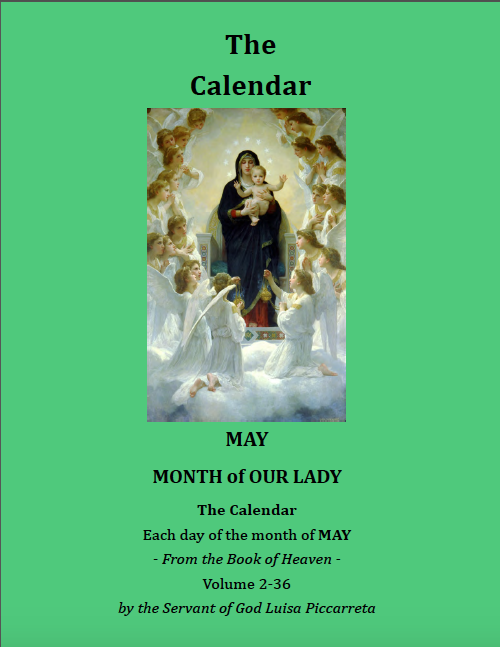 You will not feel greater because of this; on the contrary, my Will will make you smaller, and you will continue to be the little daughter of your Jesus – the little daughter of my Will” (Vol. 12, 3-23-1921). One day, being assailed by the evil spirit, terrorized, Luisa turned to her Celestial Mama, who benignly spoke to her: “Why do you fear? Your Angel is by your side, Jesus is in your heart, and your Celestial Mama keeps you under Her mantle. Why do you fear then? Who is stronger? Your guardian Angel, your Jesus, your Celestial Mama, or the infernal enemy? Therefore, do not run away, but stay, pray, and do not fear.” At that instant everything disappeared; serenity invaded her, and nothing else happened to her. 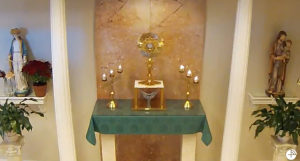 When she was nine years old, with her heart filled with joy, she received Eucharistic Jesus for the first time, and since then, she learned to remain in prayer and adoration for hours before the Most Blessed Sacrament, in her Parish Church of Santa Maria Greca. 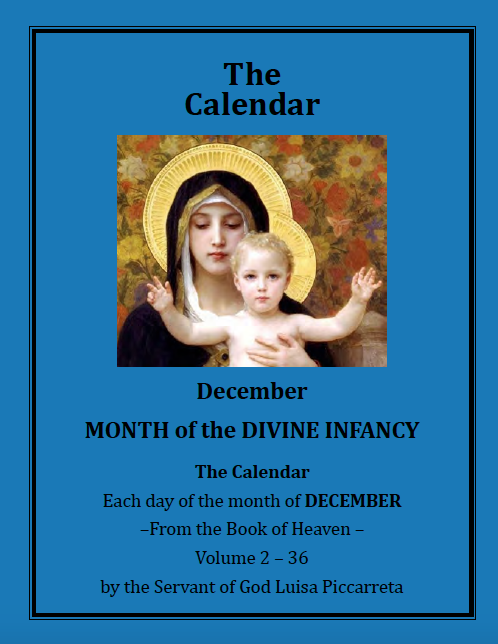 She became a “daughter of Mary” at eleven, and with great fervor diffused the devotion to her Celestial Mother among the girls of the same age. This will be one of the fundamental characteristics of her spirituality; in fact, one day she would write a Book of Meditation on Our Lady (The Virgin Mary in the Kingdom of the Divine Will). 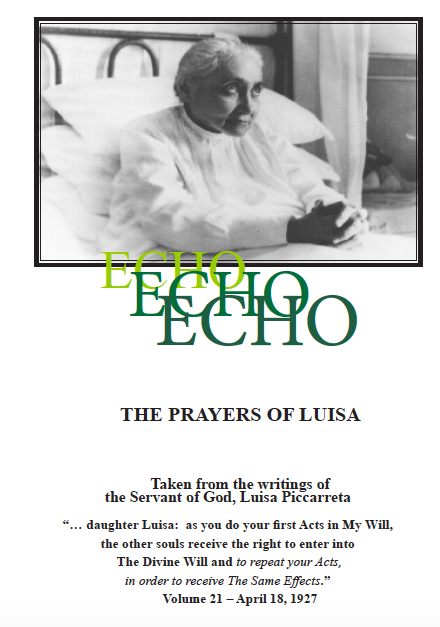 The voice of Jesus led Luisa to complete detachment from everyone and everything. 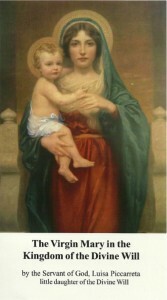 For this purpose, He gave her as a model, the humble, hidden and silent life of the Holy Family of Nazareth. All her life, Luisa would be submitted to the cares and obedience of her confessors, although, extraordinarily, they were never her spiritual directors. This role was assumed by Jesus Himself, Who molded her among a thousand sufferings and humiliations, to make of her a vessel of election and Grace, and to promote the Kingdom of the DIVINE WILL among men. When she was thirteen, while at home, Luisa heard a great uproar coming from the street, and she went out to the balcony to see what was happening. A terrible vision appeared before her eyes: the street was crowded with shouting people, and with armed soldiers who, containing the crowd, were leading three prisoners. 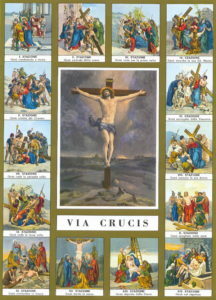 Among these, Luisa recognized Jesus, carrying the cross on His shoulders. Afflicted and terrorized, Luisa contemplated this sad procession, but when the Divine Convict was under her balcony, He raised His head and said: “Anima, aiutami!” (“Soul, help me!”). At this scene, Luisa cried out and lost her senses. 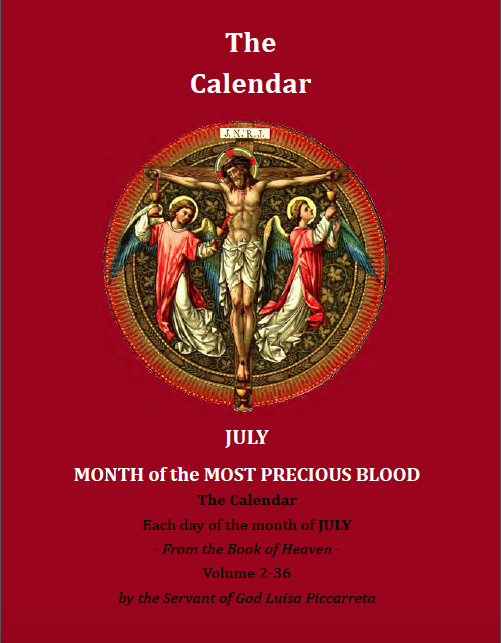 This extraordinary event marked for Luisa a decisive turning point in her life, because on that day she accepted her state of victim of expiation for the sins of men. After she accepted her state of victim, Luisa found herself very often in a state of complete unconsciousness: her body would stiffen, becoming hard like stone, to the point that they were not able to move it or raise it. These were phenomena so particular and unique as to be considered strange even by the people of her own family, who railed against her, and humiliated her continuously. However, her family was immensely worried, especially her parents, who subjected her to visits by doctors, who remained mute and dumbfounded before such an extraordinary clinical case, unable to make any diagnosis. All of this was for Luisa a trial of unheard-of suffering, which the Lord would make her go through. When the hopes of the doctors were completely exhausted, her family turned, in anguish, to the last hope: the priests. 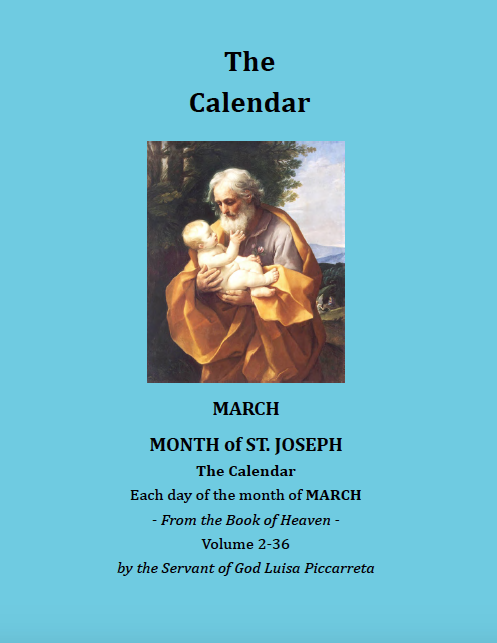 Father Lojodice was called to her home; a Passionist Priest of a holy life, who lived with his family because of the suppression of the religious orders, which occurred after the unification of Italy. Father Lojodice drew near the bed of Luisa, he blessed her, and to the stupefaction of all, she immediately regained her normal faculties. This fact, so extraordinary, produced the conviction, in Luisa and her relatives, that Father Lojodice was a Saint. From that day, Father Lojodice went to Luisa every time he was called by her family; and every time, without fail, his blessing freed Luisa from her state of immobility. The humiliations and the sufferings which Luisa had to bear during this period were unspeakable. She was misunderstood by all – considered proud, false, a cheater, and a person who wanted to draw attention upon herself. These ideas were also shared by her parents, who would think of any way – from the understanding to the violent – in order to change this crazy head. But the most terrible humiliations she received were from the priests. When they were called by her family in order to free her from her usual state of immobility, they would refuse to go; and if they did go, they would overwhelm her with the most bitter reproaches. Once they left her in that state for as long as twenty-five days. During this period, Luisa expressed to her parents her desire to become a cloistered nun. On hearing this, her parents were absolutely opposed. One day, after her insistence, her mama took her by gig to Trani, to the cloistered nuns, where they spoke with Mother Superior. But her mama, not really wanting her little Luisa to cloister herself in a monastery, revealed, in extreme detail, all the defects and the strange phenomena surrounding her daughter, adding that she was a sickly girl of weak constitution. Obviously, these details provoked a definitive refusal on the part of the Superior, who immediately dismissed her, saying that life in the monastery was very hard, and that her health would not have borne the monastic rule. And so it happened. Luisa remained nailed to her bed of suffering for about seventy years. In seeing that Luisa wasted away more and more every day, her family decided to bring her to the countryside, to their own farmhouse, to regain her health. The Lord was waiting for her, to make her pass into a new state of life. One day, while she was meditating in the solemn silence of the country of Murge, the evil one made his final assault – so violent as to make her completely lose consciousness. 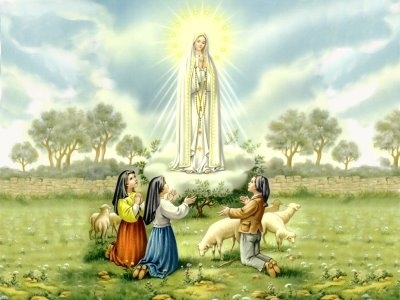 Reduced to a most pitiful state, she had a vision of Jesus suffering for sinners, and conquered by Grace, she fully consented to the Divine Will, accepting the perennial state of victim, to which Jesus and the Most Holy Virgin were calling her. She was only sixteen; and from this age began those atrocious sufferings which immobilized her for the rest of her life on her bed of suffering. 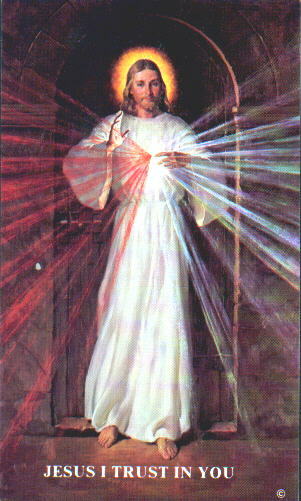 One day, still in the farmhouse, Luisa lost consciousness again, not because of the evil one, but by the Will of Jesus, who made her share in the sufferings of His Passion. As she came round from the ecstasy, Luisa felt great repugnance for any food; so she refused everything, and if sometimes, forced by her parents, she ate something, she would bring it up immediately. Her family attributed this to a new and unheard-of fuss, and therefore she had to suffer new and bitter reproaches. 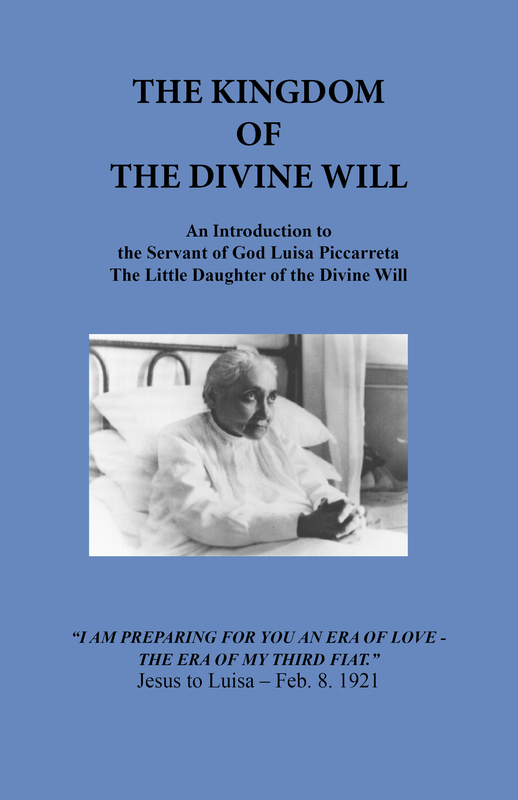 However, this was the Will of God, Who was preparing Luisa to live only from the Divine Will, in such a way that It would be her only food. In fact, this extraordinary phenomenon lasted until her death. 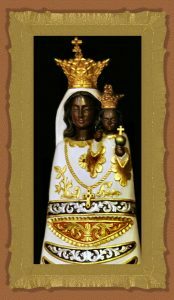 Luisa ate very little, only once a day and out obedience to her confessor; but immediately after, she would sweetly bring up the food, whole, fresh and fragrant. I write these pages and I confirm this phenomenon because I have been a spectator of it. One day, while I was in the house of Luisa, my aunt Rosaria Bucci, her faithful and silent confidant, prepared food for four people: for herself, for me, for Angelina, Luisa’s sister, and for Luisa. I was surprised upon seeing that the lunch of Luisa consisted of just 4 or 5 orecchiette [pasta with the shape of “little ears”, typical food from Puglia] and a few grapes, which I myself had brought an hour before. Everything was placed on a little plate. After my aunt put grated cheese on it, she told me: “Take it to Luisa”. Surprised by this strange meal, I brought the food to the little room of Luisa. She welcomed me with a smile, placed the plate on the appropriate bed table, made the sign of the cross, and began to eat. Feeling my state of amazement, Luisa smiled at me again, then took a grape and offered it to me. When Luisa finished her lunch (so to speak), she rang a little bell, and soon my aunt appeared, carrying a little tray in her hands. Here began the scene, which I will never be able to forget: Luisa brought up everything in a strange way; I say this, because I felt no repugnance; on the contrary, a strange fragrance diffused throughout the room. Then, removing the little bed table, my aunt closed the shutters and said: “Come Peppino, let’s go eat, for Luisa has to sleep.” My aunt brought to the table the food brought up by Luisa, and there it remained during our lunch. I counted the orecchiette – they were six, and all the grapes, whole and bright – precisely eleven. The confessors were opposed to this new prodigy, and ordered her to eat, even if she brought up everything after a little while. Up to the age of twenty-two, the life of Luisa was tormented by her need to offer herself perennially to the Lord, and by the atrocious humiliations that came from her family and especially from the priests, who, as has already been mentioned, refused to go to her house to call her back to normality, when she was caught by her state of petrifaction. 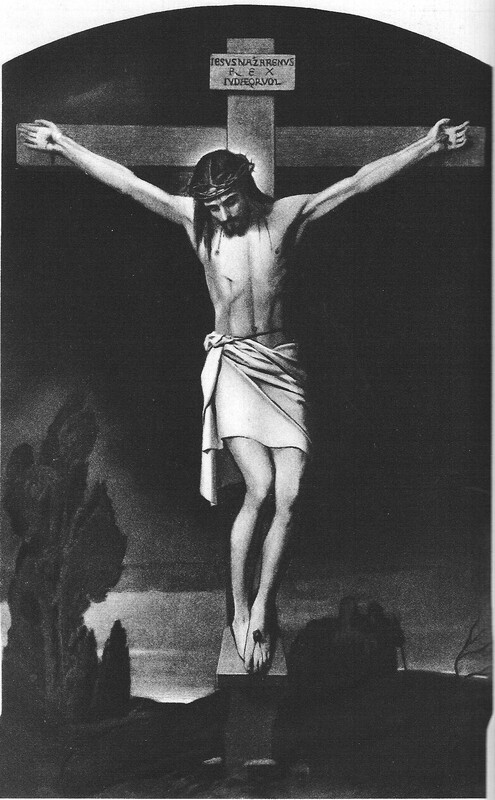 This entered into the Divine design, which, for Luisa, was a most heavy cross to carry. 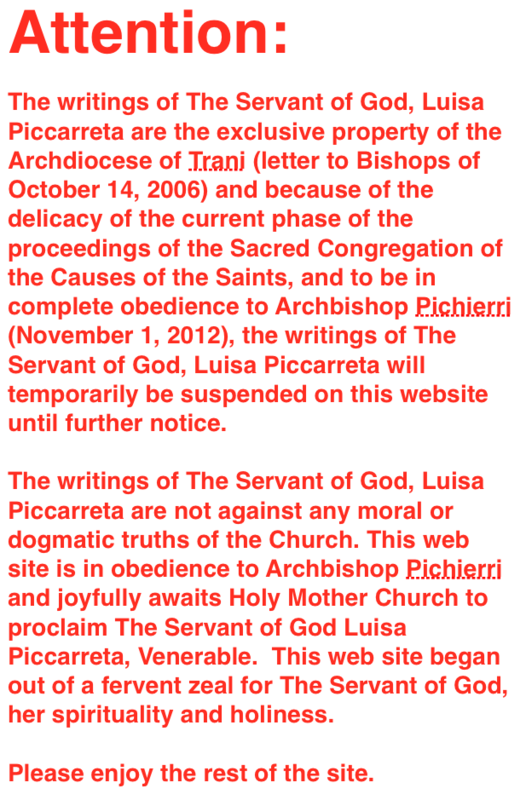 The need of the priestly authority to give or remove her sufferings constituted the greatest suffering for Luisa. The mother of Luisa, greatly grieved by the continuous mortifications received from priests – who considered these phenomena to be spells, or, at the most, follies of a fanatical girl – turned crying to the Bishop of that time, who, against every expectation, took interest in the case, and gave dispositions so that the priests would go to Luisa’s home every time the circumstance required it. 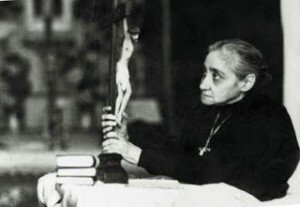 After a mature reflection, the Bishop found it appropriate to delegate a specific confessor, who, bothered with having to go there continuously – almost every day – to wake her up from her particular state, prohibited her from the repetition of this phenomenon. But Our Lord intervened directly to cause the confessor to change his decision, using the cholera epidemic, which, in 1887, claimed many victims in Corato. Luisa asked her confessor to be able to continue her state of victim of reparation and expiation for men. The confessor granted her permission on the condition that she would pray to the Lord to make the scourge of cholera cease. The cholera disappeared immediately after three days of sufferings by Luisa – who had remained motionless in her bed of suffering. The confessor had to bend to the evidence of the prodigy. 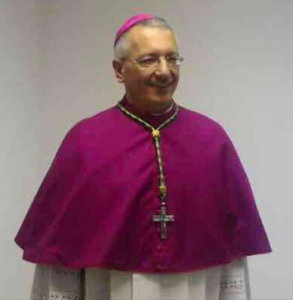 The Bishop appointed a shining figure of a priest as Luisa’s ordinary confessor – Don Michele De Benedictis – to whom Luisa opened her soul minutely; this had not been possible for her with other priests. She herself could never explain why. 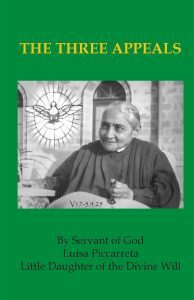 In order to understand this soul well, Don Michele imposed limits to her sufferings; even more, she could do nothing without his consent, and if necessary, she had to resist even the Lord. One day Luisa asked the confessor permission to suffer in bed for a certain time, about forty days. “If this is the Will of God, stay”, Don Michele said; but the bed was never again abandoned by Luisa, who was then, in 1888, twenty-three years old, and remained, always sitting, nailed to the bed, for the fifty-nine years until her death, which occurred on March 4, 1947. It is to be noticed that until then, even though she had accepted the state of victim, Luisa had remained in bed from time to time, because obedience to her confessors had never allowed her to remain bedridden in a continuous way. After the forty days, Don Michele too, bothered with having to go every day to wake her up, brusquely ordered her not to fall again into that state. Luisa’s reasons, which affirmed that this was the will expressed by God, could do nothing; therefore Luisa had to resist our Lord so as not to fall into her usual state of petrifaction. But the Lord wanted this soul all to Himself, to lead her along the paths of His celestial graces. So, in order to convince the confessor, the Lord revealed to Luisa the imminent war which was to break out between Italy and Ethiopia. Don Michele, always firm in his decision, was skeptical in the face of such news, but what was not his stupefaction when, a few days later, he verified its accuracy in the event. We must consider that, in those times, means of communication were not available to everyone, and in a little out-of the-way town of Southern Italy the news did not arrive very easily – and what was thought in Rome was unknown to most. Though reluctantly, Don Michele had to bend to the Will of God; and so Luisa did not abandon her bed, ever again, for all the rest of her life. It was new year’s eve of 1889. In 1898, Don Gennaro Di Gennaro became the new confessor delegated by the bishop, and so he remained for 24 years. 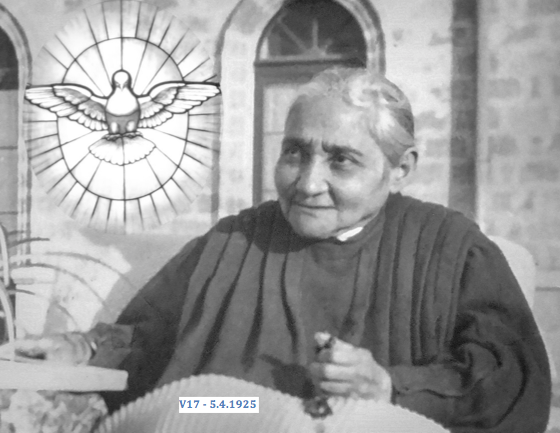 As the first thing, Don Gennaro, an “enlightened and prudent Priest”, realizing the wonders that the Lord was working in this soul, ordered her to put into writing all that the Grace of God operated in her. Luisa certainly did not expect this order, to which she had to submit with docility, even though it strongly clashed with her humility. Luisa was to write everything from the very beginning, without neglecting anything; and she was to give everything to him, day by day. Though weeping, Luisa submitted herself. The excuse of being an illiterate woman (she had attended only up to the second elementary grade) had no success: her confessor was immovable. So she began to write her volumes (36) in the form of a diary. It was February 28, 1899. 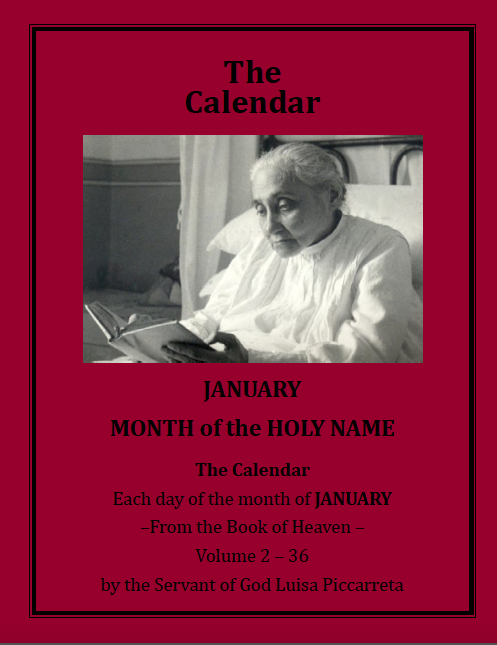 She wrote the last chapter of Volume 36 on December 28, 1938. As soon as the order to do it ceased, she no longer wrote. 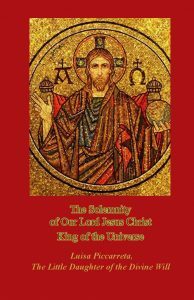 Into the most complete silence and in the greatest hiddenness of this Soul, God wanted to send the message of the Divine Will, in which the Holy Spirit wants to renew the face of the earth: the Kingdom of God on earth as it is in Heaven. So a new event of grace begins in souls, through which God wants to enrich humanity. 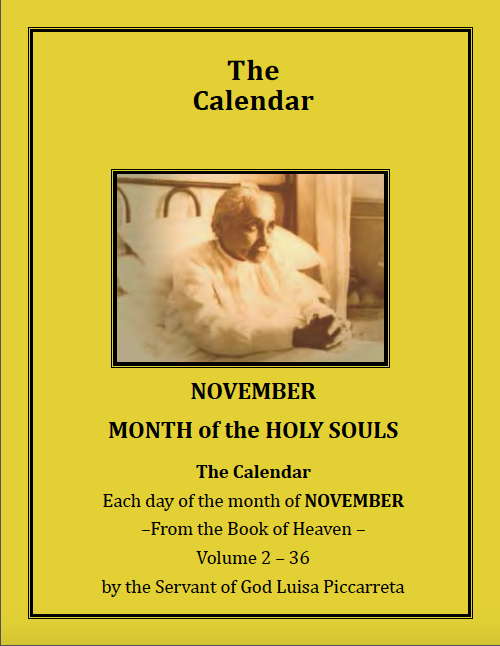 It is November 1900 – the century which will see the forces of evil being unleashed, the Christian values compromised, the voice of the Vicar of Christ little listened to, and protestations at all levels. 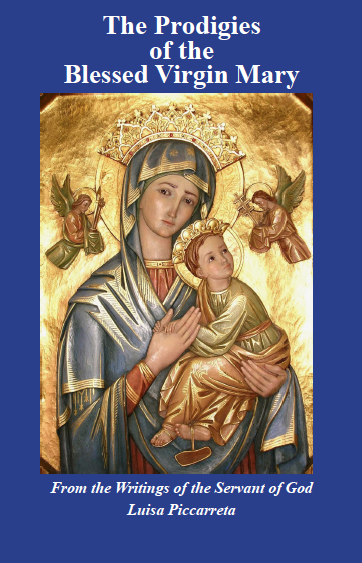 Also the Holy Church of God will suffer her silent martyrdom, and in the face of the human disasters, only the Will of God will be Her strength on Her thorny path. And precisely in this century, so troubled, the Lord gives a new era, which will invade His Church and all men of good will, and in which the triumph of Grace will be the ultimate goal: “Do not fear: I will be with you until the end of times”. Perfect conformity to my Will, because you will only be able to love Me perfectly if you love Me with my own Will.Even more, I tell you that by loving Me with my own Will, you will arrive at loving Me, and your neighbor, with my same way of loving. Profound humility, placing yourself, in front of Me and of creatures, as the last among all. Purity in everything, because any slightest fault against purity, both in loving and in operating, is reflected all in the heart, and it remains stained. Therefore I want purity to be like dew upon the flowers at the rising of the sun, which, its rays reflecting upon them, transmutes those little drops into as many precious pearls, such as to enchant the people. In the same way, if all your works, thoughts and words, heartbeats and affections, desires and inclinations, are adorned with the celestial dew of purity, you will weave a sweet enchantment, not only for the human eye, but for the whole of Heaven. This happened on November 22, 1900. Such a special gift from God is an exclusive prerogative of Luisa, but must be extended to all men who accept this new event of grace. Luisa never abandoned her bed of suffering and remained sitting in the same position for 64 consecutive years – not counting the first six years – without ever contracting the wounds on her body, which are inevitable during long illnesses. 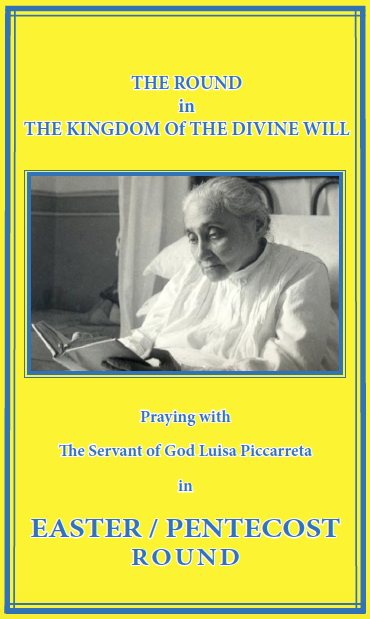 In the morning Luisa found herself huddled in her bed, as though petrified, to the extent that no one could manage to move her, until her confessor or any other priest would come in prayer to bless her; only then would Luisa begin to move and be released. 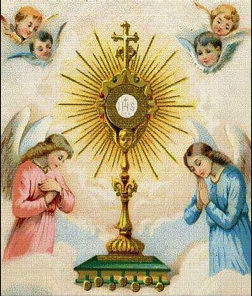 So her sister Angelina and faithful Rosaria would place her again in her usual position (sitting), while the priest would begin Holy Mass on a movable altar, which was in her room. Luisa participated in the Mass with great devotion; she received Communion every day, and then remained in meditation for about two hours. Afterwards, she would begin her work of tombolo. Many girls attended her home, working and praying with Luisa, and meditating together on the Passion of Jesus Christ. Every morning, before starting her day, out of obedience Luisa had to read to her confessor all that she had written the night before, and give it to him. This lasted until 1938. These writings formed 36 volumes, some of which have been published. Around one o’clock Luisa ate a small amount of food, which she would punctually bring up. Afterwards, she would remain in meditation for a few hours, and then begin her ordinary work. 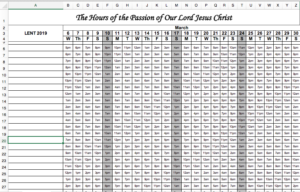 Around midnight Luisa would begin to write all that the Lord had worked in her during that day. In this way her day would end. This way of life lasted until her death. In 1922, her confessor, Fr. 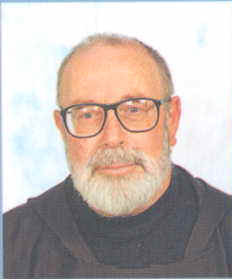 Gennaro, died and by order of the bishop Fr. Francesco De Benedictis took his place. Fr. Francesco died in January, 1926. The Bishop, then, appointed a young priest, Fr, Benedetto Calvi, parish priest of Santa Maria Greca, who assisted her until her death. This extraordinary figure of a priest received with maternal care all the concerns, the joys and the sufferings of this soul, privileged by God. Luisa was struck by unheard-of storms, which would certainly have crushed any other person, but which were surpassed by her profound humility, obedience and faith – true food of this chosen soul. Her confessor and the persons who were close to her – especially her faithful Rosaria – suffered tremendously, and while the weak (of spirit) abandoned her, they remained at her side with humility and faith, until the triumph of the Work of God. After the storm passed by, and the waters were calmed, Luisa continued her humble and silent life, always assisted with love by her faithful Rosaria and by all the souls who had been conquered by her spirituality, especially the sisters Cimadomo. It was in this last period that I had the singular fortune to know her: specifically, my contact with Luisa goes from 1942 until 1947. Luisa wrote 36 volumes of highest spirituality, some of which were published in different editions and spread throughout the world. 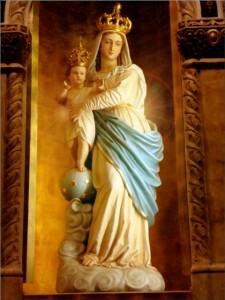 At the age of 81 years, ten months and nine days, her parenthesis in history ended – to be projected into God. The joyful transit happened on March 4, 1947, at six o’clock in the morning. Her illness (bronchitis), the only clinical illness she actually ever reported, had lasted only fifteen days. 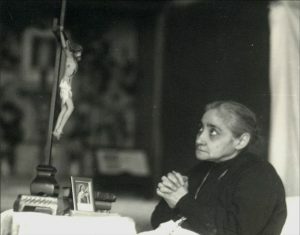 As it appears in the picture, the dead body of Luisa is sitting on the little bed, just as when she was alive; nor was it possible to stretch it out through the strength of various people. She remained in that position; so a special casket had to be built. Her body was not subject to the “rigor mortis” typical of all human bodies after death. This was noticed each day she was exposed to the eyes of the people of Corato, and to those of many foreigners who came to Corato for the purpose of seeing and touching with their own hands this unique and marvelous case: all were able, with no effort, to move the head to all sides, raise her arms and bend them, bend her hands and all the fingers. Even the eyelids could be lifted and her bright eyes, which were not veiled, could be observed. Luisa seemed to be alive, as though sleeping, while a group of doctors, convened for the purpose, after a careful examination of her body, declared that Luisa was actually dead, and therefore it was to be considered a true death and not an apparent death, as everyone had imagined. Luisa used to say that she was born upside down, therefore it was just that her life be upside down, compared to the lives of other creatures. Also her death was upside down… She remained seated, as she had always lived, and sitting, was she to go to the cemetery in a casket which was built for the purpose, with the sides and the front of glass, so that all might see her, as a queen on her throne, clothed in white, with the “FIAT” on her breast – the little daughter of the Divine Will, whom the Lord wanted to remove from her silence and humility only at her death. More than forty priests, the Capitolo [the Ecclesiastical authorities] and the local Clergy, were present; the sisters, who brought her on their shoulders in turns, and an immense crowd of citizens. The streets along which the procession was to pass, were packed – incredibly; even the balconies and the roofs of the houses were crammed with people, and the procession proceeded with great difficulty. The funeral was celebrated in the Matrice Church by the entire Capitolo. All the people of Corato followed the body of Luisa to the cemetery, and everyone tried to bring home a souvneir of the flowers which had accompanied and touched the body. A few years later, the body of Luisa was transferred to her Parish Church of Santa Maria Greca, where she is humbly waiting for her glorification. 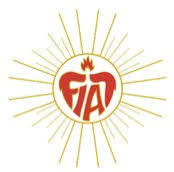 of the Archbishop of Trani, Fr. Reginaldo Addazi O.P. 1. 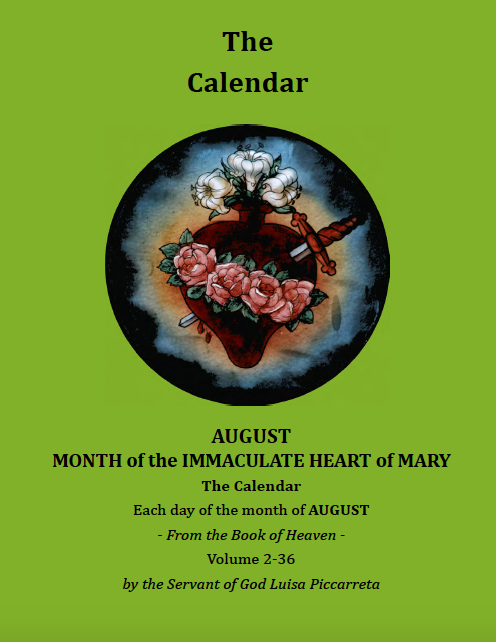 O Most Sacred Heart of my Jesus, Who chose your humble servant Luisa as herald of the Kingdom of your Divine Will, and as angel of reparation for the innumerable sins which sadden your Divine Heart, I humbly pray You to grant me the grace which I beseech from Your Mercy through her intercession, so that she may be glorified on earth as You have already rewarded her in Heaven. Amen.